A 17-year-old girl riding her bicycle near Riverview High School on Tuesday morning was hit by a car. According to the Hillsborough County Sheriff’s Office, the girl, who is a Riverview High student, was struck by an Acura sedan on Whispering Creek Boulevard near Balm Riverview Road just south of Boyette Road. The driver of the Acura, a 23-year-old man, waited at the scene for deputies to arrive. According to officials, the man won’t be cited in the crash. The crash occurred just before 7 a.m. The accident caused the roadway to be shut down for about an hour. Authorities said the teen received non-life threatening injuries, however she was airlifted to an area hospital. The Tampa Bay area is full of beautiful scenery and many people choose to take it all in by getting outdoors and riding a bike. 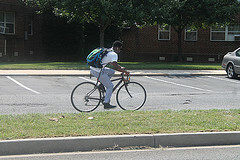 Many children and teens ride bicycles to school and adults often use them to commute to work. Sadly, many bicyclists are injured or killed by negligent drivers every year in Florida and across the United States. The Tampa Bay Injury Lawyers at Whittel & Melton are committed to helping bicycle accident victims recover full compensation for their injuries. We also help families of those who have lost loved ones obtain fair compensation for the wrongful death of their loved one. Even though a bicyclist may do everything right, serious injuries can still happen. A negligent motorist can pull out in front of a cyclist or make a turn without looking and collide with a biker. Regardless of how your accident occurred, our team of injury lawyers can handle all aspects of your case so that you can receive adequate compensation for your losses. Even if your accident involved an uninsured/underinsured motorist, we can do everything in our power to make sure you recover a monetary award, including from your own insurance company. If you were injured or a loved one was killed in a bicycle accident in Hillsborough County or throughout the Tampa Bay area, a Tampa Bay Injury Lawyer at Whittel & Melton can help. Call us today at 813-221-3200 or contact our law firm online. We can help you achieve a successful outcome, no matter how complicated your case may be.